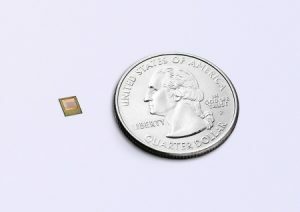 It enables camera modules for integration in smartphones with a footprint of less than 12 mm x 8 mm, including the receiving optics and VCSEL (Vertical-Cavity Surface-Emitting Laser) illumination. Market forecasts expect smartphones with 3D sensing functionality to increase from about 50 million units in the year 2017 to roughly 290 million units in 2019. Compared to other 3D sensor principles, such as stereoscopic light or structured light approaches, Time-of-flight offers advantages in performance, size and power consumption of battery-operated mobile devices. Two factors provide the camera’s range and measurement accuracy: the intensity of the emitted and reflected infrared light, and the pixel sensitivity of the 3D image sensor chip. Cameras of Infineon and pmdtechnologies are the only ToF-based depth cameras integrated in commercially available smartphones. They have convinced leading camera module makers for mobile phones and are proven for efficient volume production with high yield. In addition, they do not have to be re-calibrated during use. Samples of the new Infineon 3D image sensor chip are already available. Volume production is scheduled to start in Q4 2018. Software partners like Sensible Vision Inc. and IDEMIA offer application software for user face detection and authentication. Demos with REAL3 3D image sensor chip are available.